Hays, KS (Feb. 6, 2019) — The Hays Bass Anglers Association is excited to host two open bass fishing tournaments this spring. 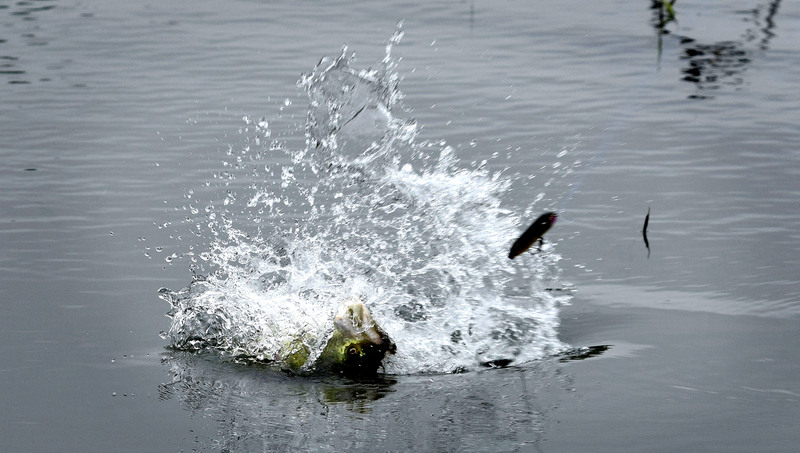 The first is the Cedar Bluff Open, which will be held on April 6, 2019, at Cedar Bluff Reservoir and launching from the Overland Boat Ramp in Cedar Bluff State Park. The second is a new addition to the tournament schedule this year and will be the debut of the Wilson Open, scheduled for May 11, 2019, and launching from the Hell Creek Boat Ramp in Wilson State Park. These spring tournaments are planned to be continuing annual events for HBAA in addition to the popular fall classic, The Big Bass Challenge, which is scheduled for Sept. 7th. Come join the club for these two spring events which are certain to bring line-stretching, pole-bending excitement. Download the flier for the Cedar Bluff Open tournament. Download the flier for the Wilson Open tournament. Hays, KS (Oct.1, 2019) — The Hays Bass Anglers Association set the date for the 2019 Big Bass Challenge during the club’s regular monthly meeting Monday night in Hays, Kan., for Saturday, Sept. 7, 2019, at Lake Wilson pending approval of final permitting. Mark your calendars now to reserve the date for next year’s event. 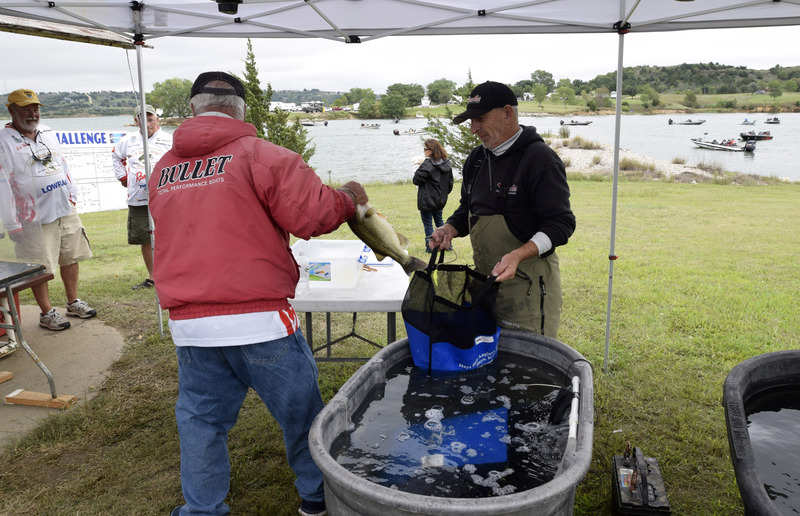 Wilson, KS (Sept. 8, 2018) — Anglers battled wet, cool and windy conditions during the 18th Annual Big Bass Challenge at Lake Wilson. Ninety-nine anglers in 50 boats participated in the annual event put on by the Hays Bass Anglers Association. Following the playing of The National Anthem , boats were called out by number, one-at-a-time, to begin the tournament. 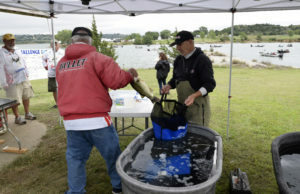 Cool and breezy conditions on tournament day followed more than a week of rainy weather, but that did not hinder the bite as anglers caught quality fish throughout the event keeping club members from the Hays Bass Anglers Association busy weighing in fish every hour. The team of brothers, Jeff Skala from Gibbon, NE, and Dan Skala from Manhattan, brought in the big bass of the tournament, a 5.14 pound largemouth. Despite the conditions, anglers weighed in good quality smallmouth and largemouth bass during the event. “The Challenge was a great success as a number of fish over four pounds were weighed in during the tournament,” said Keith Harmoney, the Big Bass Challenge tournament director for HBAA. Anglers were treated to a free post-tournament BBQ with refreshments and more following the event. Hourly winners received checks for first and second place during the awards celebration which followed the tournament on Saturday afternoon. “HBAA wants to thank all anglers and sponsors who helped make this year’s event a success,” Harmoney said.